We ended up in Brussels this past weekend, having discovered that train tickets there are relatively inexpensive, with the total trip time taking a little over two hours (and this is the "cheapy" slow train). Train travel in this part of Europe is really incredible - for example, in Den Haag we had 5 minutes between our incoming train leaving and our new train arriving at the station. Both were completely on time and we made the transfer easily. Granted there are occasional delays, but when people here complain about the train service, I internally chuckle wondering how they would feel about Amtrak where I have experienced hours and hours of delays for it being too hot/cold/rainy/snowy/etc. That being said, I do recognize that our country is considerably larger than the Netherlands and trains are not only far less frequent, but must traverse greater lengths, leaving more potential for delays along the way. 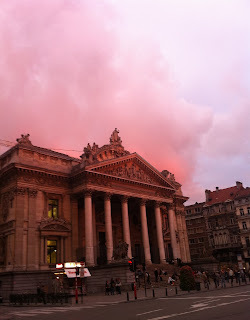 Brussels is an incredibly interesting city - one full of dichotomies: in language, architecture, and attitude. This is evident from the moment you set foot on your first "rue" AND "straat." Every street name is written in both Dutch and French, which makes map-reading slightly more...consuming. Brussels from a geographic standpoint is encompassed in Dutch-speaking Flanders, but was unable to avoid French influence from the south. While we expected the city to be actively bilingual, we were repeatedly surprised that French appeared to be the more common of the two languages. So once again, I relied on David's French to get us around the city and I [helpfully] chimed in with things such as: bonjour, bonsoir, merci, or the occasional wink. Arriving at the old city, one cannot help but be captivated by the ornate grandeur of the buildings making up the Grote Markt/Grand Place. And just as strikingly, one can wander less than a mile away and experience the imposing presence of the sleek, modern buildings of the European Union. The contrasts present in Brussels are definitely evident in its two most famous landmarks, which are within a few hundred meters of each other: the Grote Markt/Grand Place, a UNESCO World Heritage Site and Manneken Pis, a 24 inch, 17th century statue of a a naked little boy peeing. How's that for serious meets ridiculous!? Oh wait, I haven't mentioned that Manneken Pis has a wardrobe larger than mine, consisting of over 800 outfits - everything from an outfit made up completely of condoms to mark World AIDS Day to a white Elvis Presley jumpsuit. Finally, as you walk through the city, you can see how the old city still retains the charm and grandeur of past times but is - literally - colored by modern Belgian humor. As Belgium is home to the creators of many comics from Tintin to the Smurfs, the walls of many buildings in the old city are adorned with huge, colorful comics painted directly on them. It's incredibly fun to turn a corner and not know which visual landscape will greet you. Didn't realize that comics Tintin and Smurfs originated in Brussels! Nice overview on Brussels. I wish I was there!